Due to the high demand and the use of phased transactions (not supported by the MyNxt Web Wallet) in the first ICO batches, and specially after the release of the Nxt Client 1.11.7 to allow users to place ICO purchase offers before every batch is placed for sale, it is NOT RECOMMENDED to use the MyNxt Web Wallet to participate in the IGNIS ICO, at least for as long as the demand exceeds the amounts offered in each sale. Thus, the steps below describing how to participate in the IGNIS ICO from the MyNxt Web Wallet will hardly succeed until the supply for sale in every ICO sale round remains available for at least a few blocks. To participate in the IGNIS ICO, the Nxt Client 1.11.8 is highly recommended. You can see all the details about the IGNIS ICO in the Jelurida website. 1.- Same as it happened with the initial Ardor distribution snapshots, the MyNxt Web Wallet is compatible with the snapshots that will happen after the IGNIS ICO and before the Ardor genesis block. 2.- Starting today and until the end of the IGNIS ICO, the MyNxt Monetary wallet plugin, needed to buy currencies issued under the Nxt Monetary System, becomes FREE to install for all the MyNxt Wallet users. - How can I participate in the IGNIS ICO using my MyNxt Web Wallet account? 1. Log In to your MyNxt wallet account. 5. 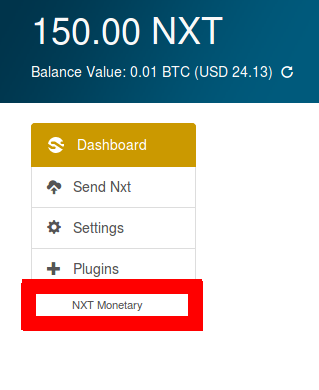 The Nxt Monetary plugin options will appear. Here you can use the Search box to find the official JLRDA token. IMPORTANT: Only the official JLRDA token will be exchanged for IGNIS in the Ardor snapshot. Beware of fake tokens issued with slightly different names!! Notice the note near the bottom, "Lowest sell offers". As soon as the ICO starts, below you will see the current price for JLRDA tokens for as long as there's tokens left for sale in this round. If instead of a price you see "No sell offers", like in the screenshot above, this means that either the ICO has not started yet, or that the JLRDA tokens for this round are sold out. If so, make sure to check the Jelurida ICO details to see when does the next round start! The total NXT cost will appear in the "Total" box below, which of course cannot exceed the NXT balance in your MyNxt wallet account. Remember that you need 1 extra NXT to pay the fee for the buy currency transaction. 8. After clicking buy, you'll need to enter your MyNxt master password to authorize the transaction as usual. And that's all. In a few minutes, once your Buy order has been processed (and unless the last JLRDA tokens were sold in the previous block!) 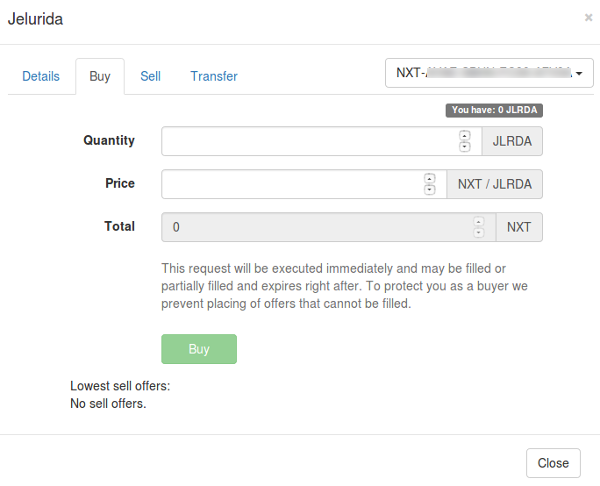 you will see your JLRDA tokens in the "My Currencies" tab in the Nxt Monetary plugin. - After the ICO ends, 0.5 IGNIS will be automatically reserved for every 1 NXT I have in my account. Will this happen with the NXT I still have in my MyNxt wallet account? - What do I need to do to prepare my MyNxt wallet account for the Ardor genesis snapshot and the Ardor launch? - Granting 1 Ardor main chain token for every ARDR asset held in a Nxt account in the moment of the snapshot. - Granting 1 IGNIS for every JLRDA token held in a Nxt account in the moment of the snapshot. 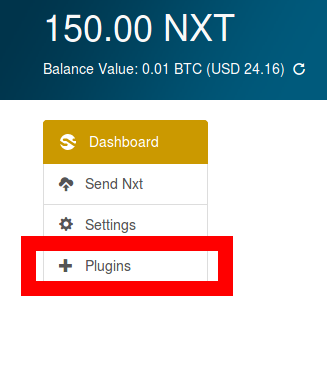 - Granting 0.5 IGNIS for every 1 NXT held in a Nxt account in the moment of the snapshot. 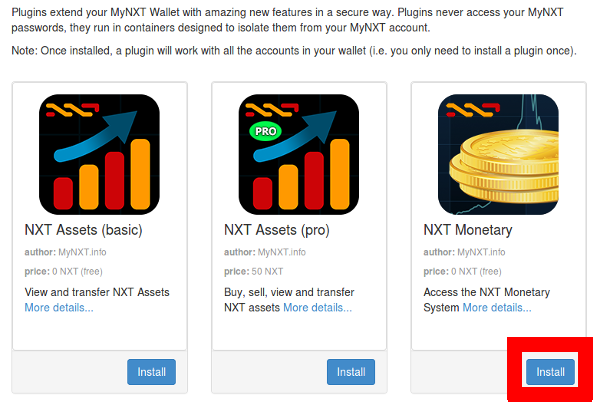 Your MyNxt wallet account will participate in these snapshots with no action required from you. However, in order to use the Ardor Client after the launch and access your new tokens you will need to follow this tutorial (you can do it anytime before, during or after the ICO, even after the Ardor launch) to export the Nxt passphrase for your MyNxt wallet account. The same passphrase will unlock an Ardor account with all the tokens you earned in the snapshot. This post will be updated to reflect any details we overlooked. If you have any question that is not answered in the information above, please post a reply in this topic.